Winged adults of citronella ants sometimes emerge inside homes. Playground ants: Citronella or Large yellow ants, Acanthomyops interjectus, and field ants, Formica sp. A common worry for many parents is that close encounters between youngsters and insects may result in nasty bites or stings. This week I received a phone call from a friend concerned about two disquieting ant nests found near a sandbox in a backyard play area. Ants are quite noticeable this time of year as they capture prey, forage, and enlarge their colonies. At my friend’s home just beyond the edge of the sandbox, a patch of loose soil erupted around blades of grass in the lawn. Issuing from several vents in this mini-volcano were small black ants about a quarter inch in length. These busy workers were field ants, one of the most common ants found outdoors in our region where they often build colonies beneath stones or under logs as well as in lawns. Field ants rarely enter homes, but spend most of their time gathering food such as small insects and plant material that they eat and feed to the queen and developing brood back in the colony. Field ants also crave sweets and are often seen guarding honeydew-producing insects like aphids. We visited field ants in a previous episode of Bug of the Week in May 2006, “Field ants to the rescue.” In this fascinating symbiotic relationship, ants protect aphids from hungry predators and in return receive nutritious honeydew from the aphids. While some species of field ants are able to secrete an irritating spray of formic acid from their abdomen when pestered by a predator or human, the small field ants I encountered offered no such resistance when harassed by a bug geek. A second remarkable species of ant was enlarging its colony along the upright boards of the sandbox. Brushing the soil aside revealed dozens of bright orange ants imbued with a delightful aromatic odor of citrus. Acanthomyops interjectus goes by many colorful names including citronella ant, yellow ant, and lemon ant. Special glands near the jaws of the ant produce their memorable scent. When threatened by an intruder, citronella ants release their scent and nest mates come a running to assist in the defense of the colony. Other chemicals produced by glands in the abdomen help ants ward off enemies. Chemical warfare is an important strategy used by many species of ants. The workers of citronella ants tend to honeydew producing aphids and mealybugs in subterranean galleries. Citronella ants often nest near structures such as sandboxes or along foundations of homes. Sometimes these nests extend under slabs or into crawl spaces beneath living spaces. 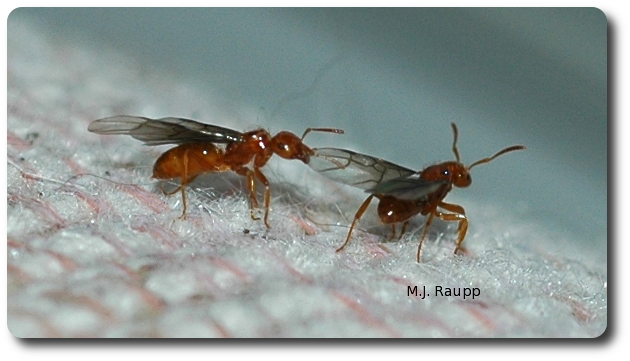 On a sunny day in spring, it is possible to find winged queen ants called alates emerging inside a home and gathering on windows as they attempt to find their way outdoors to establish new colonies. This impressive exodus can last several days as we learned in an episode from April 3, 2006 entitled “The sweet smell of ants.” The good news for my dutiful friend is that both species of ants in his yard are harmless varieties unlikely to cause problems for children or pets or to become a nuisance as home invaders. They provide an interesting opportunity to observe the curious ways of a pair of Mother Nature’s most industrious creations. Special thanks to Harry for providing the inspiration for this episode. The delightful book “The Insect Societies” by E.O. Wilson served as a reference for this story.